Seat-Pack M is compact but still quite large, ideal for bikepacking, your next microadventure or the next gravel grinder or MTB trip. With 11 litres/ 671 cu.in. volume the waterproof Seat-Pack M offers enough storage capacity for everything you need to bring along. The pack is fixed to the saddle rails or seat post. A simple strong Velcro is sufficient for fixing it to the seatpost, only 6 cm/ 2.4 in. mounting height is required; therefore the pack is perfect for small sized bike frames, fullies or bikes with submersible seat post. 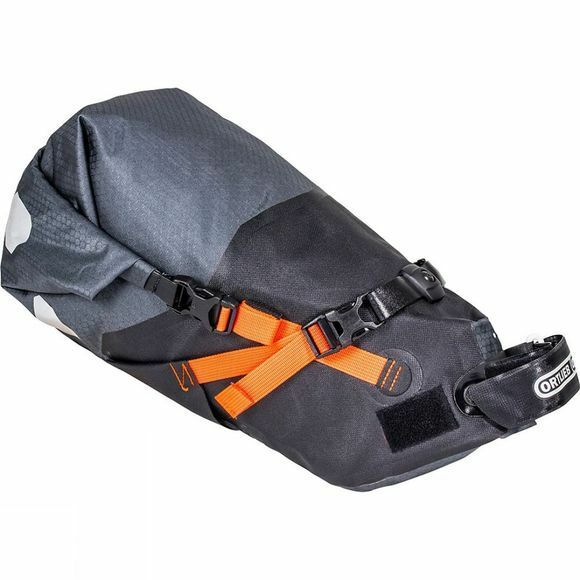 A valve and adjustable straps assist in quick and easy compression when packing the bag. A sturdy internal stiffener ensures safe transport of your gear also in off-road use. The reinforced fabric at contact points with the saddle and mountings on the saddle rails keep the Seat-Pack M in the correct position. In addition, the saddlebag acts like a mudguard. The compact Seat-Pack M is PVC-free and made in Germany. In combination with ORTLIEB‘s further bikepacking series it is the perfect gear for micro adventures, self supported races or the next adventure. Maximum capacity: 3 kg/6.6 lbs.